The success and longevity of fresco painting depends largely upon how the mortar is prepared and applied. While I often hired a plasterer, before I did this, I researched the process thoroughly and learned to do it myself. 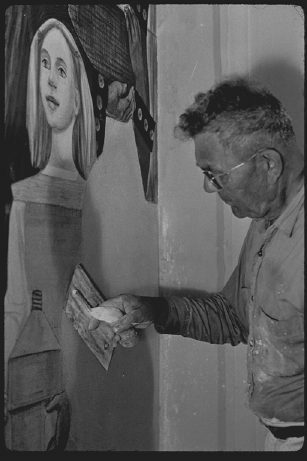 Knowledge of the plastering techniques and recipes is an absolute necessity for the fresco artist. It is the only way to maintain control over the final outcome of your work. To begin with the sand must be dry. Wet grains of sand prohibit the lime from carbonizing and adhering to the surface of the wall and to other grains of sand. The lime plaster must also be without extra water, which again would prohibit the carbonization process. It should have aged a year or two before being used. While dryness was a priority as a normal condition for the base wall for a fresco, the wall must be very wet when beginning to apply the plaster into which the fresco will be painted. Poorly wet walls will cause the mortar to come off or remain soft. The wall must give water to the fresh plaster coat and not swallow it up. If the wall is not wet enough, there is the possibility that the lime-water will absorb into wall instead of working its way outward. So it is very important that after the time has been spent preparing the lime and sand correctly, the wall must be wet thoroughly to allow the adhesion of the lime plaster. Soak the wall from 1 day to 1 week. This is best done with a fire hose. Four coats of thin plaster are applied for the ground of the fresco. Each layer has its unique requirements. The first three are laid all at once; the final layer, the intonaco, is laid piecemeal as the work progresses. I discovered that if I extended the area set for a day’s work about seven inches beyond the area that I planned to paint in one work session, that I could extend the length of the painting session several hours beyond the time which would be allowed if I had plastered only the area to be painted. The frescoes I painted were done at northern latitudes (northern Oregon and Minnesota) and I found that my working day lasted from 18 to 22 hours with this method. For more southerly locations, the day would be 12 to 16 hours. In the following section, the specific details are given for each layer of plaster. Consistency: Mortar just threatens to run off a tilted trowel, more, liquid than other coats. Mix the lime putty and the dry mixture without the addition of water, in to a new box (or one that has never been used for anything but straight lime and sand plaster.) Add the lime putty to the dry mixture by squeezing the lime through a 29-32 mesh screen. A puddler and puddler box is the best way. Let the mixture, without the addition of water, soak for 2 days. The remix it several times by chopping it until it becomes uniform in color. Water can be added a bit at a time after the first two choppings, but only enough water so that it slips on the trowel and holds its shape in throwing. First Coat: Thrown, 1/2" thick. Wet wall thoroughly first, giving it all it will take with a water hose or sprayer. Go over it several times. Chop mortar again before using, and don't add more water. Throw mortar with a squat broad diamond shaped trowel. Throw from a short distance from the wall and in a slanting direction, from bottom to top, from left to right, and with a slight twist of the trowel. New boards should be placed so as to catch falling mortar, so that it can be picked up and re-mixed with the batch. Throw mortar from a small box that can be moved along side as one advances with the work. Throw so that the mortar is squeezed tight against the wall. Throw mortar vigorously so that it spatters - throwing with force avoids air bubbles which may burst. Level the coat by rubbing it off and building it up, with the straightedge, darbe, and water level. It must be done carefully so as not to loosen the mortar. Let wall dry. Second coat: Identical to the coat described above, following the directions explicitly. Check this coat thoroughly by carefully tapping the surface to see that it makes a good binding. If it is loose in any place remove the plaster and replaster it with mortar left from the scratch-coat. Sift dry sand into new box. Add lime putty to sand, by squeezing it through a 29 - 32 mesh screen, without the addition of water. Force it through, using a puddler and puddle box. Mix them together with a hoe, adding no water. Shovel the mixture to one end of the box, the chop, slice, and cut it down to the other end of the box. Work it over twice and add no water. Consistency should be a little dryer than the roughcast, threatens to run but does not do so. Cover it and let it soak 2 days. Then remix it by chopping it through 6 or 7 times with a hard swinging of the hoe. Do not add water under any circumstances, and do not add anything else. Skimcoat: Wet wall thoroughly with a spray, going over it several times so that the water can soak in during the intervals. Take apart from the brown-coat mixture enough mortar to make the skimcoat. The skimcoat is made by thinning this brown-coat mortar with water, and quickly and thinly laying and floating it over the scratch-coat. Brown-coat: After a short time of setting the brown-coat is laid into the wet skim coat. Squeeze the mortar tight into the skimcoat. Don't paddle the mortar as that brings water to the surface. Add water to the mixture only if absolutely needed and then only at the table before filling up the hawk. The mortar should be heavy as possible, dryer than that used for the scratch-coat. As soon as coat is laid check it for air bubbles and cracks with a needle or point of the trowel, and press them together again. Press cracks together. Scratching: Scratch the brown-coat all over, combing it in all directions with a comb with long teeth made from a piece of galvanized sheet metal. 1/2" thick, made up of skimcoat followed by sandcoat, wet into wet, using same mortar for both boasts. Mix in same box used for brown-coat, and mix it according to the directions given for the brown-coat. Do not add water and do not add anything other than lime and sand. Consistency is the same as the brown-coat, a little dryer than the roughcast, threatens to run but does not do so. If possible, lay skimcoat onto nearly dry brown-coat. Begin when second coat no loner gives under pressure of finger (20 minutes depending upon latitude and atmospheric conditions) If brown-coat has dried, let it dry thoroughly, and then wet all and apply skimcoat made from the sand-finish mortar, following the directions given for the skimcoat to the brown-coat. Cut the skimcoat well into the under-coat, and float. Follow the skimcoat immediately with the sand-finish coat, wet into wet. Squeeze the mortar tight. Add water only if absolutely needed and then only at the table before filling the hawk. Follow directions given for laying brown-coat and checking for air bubbles and cracks. Trowel the surface smooth, and as soon as it can stand the pressure of the fingers begin floating (20 minutes at northern latitudes, depending on atmospheric conditions). Start at the end where the plaster was first laid. Splatter water, when needed, just ahead of the float, in uniform coordination with the float, slightly cutting and distributing the mortar evenly. Don't paddle the mortar with the float, it will bring water to the surface. Float with a firm pressure and circular movement. Use as little water with the float as possible. If cracks should appear, brush them together with the skimcoat material, push them back, and squeeze them together with the trowel. When coat is dry check it for solidity, tapping the surface with the wooden end of a pencil. If there is a hollow sound mark off the spot on the plaster, pull out the plaster and replace with same mortar. 3/8" thick, made up of two skimcoats followed by final coat, wet into wet, using same mortar for all three coats. Mix enough mortar at the beginning to do the whole job, and mix twice the amount of mortar generally estimated to do the job. Mix the sand and lime together with a hoe and shovel to one end of the box. Then chop, slice, and cut it down to the other end of the box. Work it over twice and do not add water or any other thing. Cover and let it soak 2 days. Then remix it by chopping it through 6 or 7 times. Do not add water under any circumstances. Hard swinging of the hoe is necessary. Since this mortar must be used during the painting period of the fresco it must be maintained in good condition by daily remixing. Store so that it does not become contaminated with any other substance. The area to be plastered will be the day's painting section. Layout the area to be plastered beginning with the upper left corner and progress across the fresco, left to right; top to bottom. Layout the area to be painted plus a 7' border. The border gives the plaster a longer paint-accepting life because it slows the drying process. Each patch consists of two skimcoats and one final floated coat, the intonaco. This is made by thinning the mortar with water and laying and floating it quickly and thinly over the sand-finish coat where the patch is to be made. Lay the skimcoat, cutting into the old lime-skin. Float. Wet the area to be plastered, and well beyond the area, from bottom upwards by suing clean water in a glass held against the surface and moved horizontally upwards, giving the area an effective soaking and washing of all loose dust. Use a wetting brush in bad corners. Do no touch any previous painting with either the brush or the water. The edge of the cut of former patches should be well moistened with the brush. If the 1st skimcoat has been laid the night previous then the area is wet again according to directions given above. If the 1st skimcoat has just been laid, give it 15 to 20 minutes setting up time, and then follow 2nd skimcoat wet into wet, and float. Do not let the skimcoat get onto the surface of the finished painting, however, if it does happen it can be promptly lifted from the color surface by using a clean brush squeezed with out in clean water. The joint: Immediately after the skimcoat is laid, quickly spread the intonaco along the cut edge of the patch, squeezing the mortar tight against the cut by using the corner of the trowel. Spreading and troweling are done simultaneously. Joining is made with the finishing trowel; only small parts and tight corners are laid with the smaller painting trowel. Dip the trowel in water and quickly finish the joint, and then follow it with light troweling over the whole area. Spreading of the intonaco and troweling to an even thickness are done simultaneously. Speed is important in order to prevent an annoying dryness next to the joint. Do not over-trowel. Float the entire area with a wooden shingle float, following it with a slight spray of water.